" Comic - With Drawings of A Dog and a Puppy - C. 1907 to 1915. " (1761) POSTCARD: Comic - With Drawings of A Dog and a Puppy - C. 1907 to 1915. -Condition: Very Good. - Not Posted. 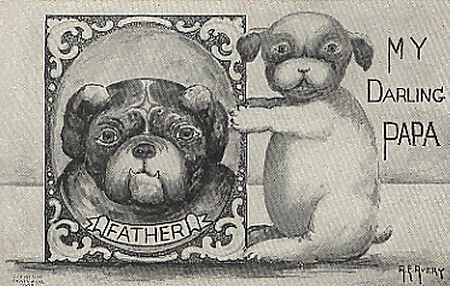 Illustration of Puppy holding a picture of a dog with Father printed under his picture. Card says "My Darling Papa". A pre cursor to Father's Day Cards! Father's Day was the conception of Sonora Dodd who in 1909 decided to instigate the celebration to honor her father. She held the first Father's Day Celebration in Spokane, Washington on the 19th of June in 1910. Price: $5.00 + shipping.